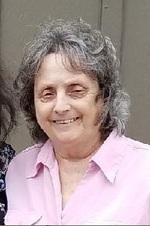 Patricia Joyce Kuhn age 78 of Hugheston entered into rest on April 2, 2019 and is now home with Jesus. She was born September 7, 1940 in London and was the daughter of the late Ozion and Gladys McDaniel Wilson. She was also preceded in death by her husband Richard L. Kuhn. She was a former employee of the Piece Good Shop in Kanawha City and Magic Mart at Quincy. She loved her family and church family and was a loving and wonderful wife, mother, grandmother and great-grandmother. She was a life- long member of the Hughes Creek Community Church where she loved singing in the choir and she loved to volunteer at the Montgomery General Elderly Care. Surviving: daughter Joyce “Joy” Long and her husband Shaun of Buffalo, WV; grandchildren Zach Long, Austin Long and Faith Long Wine; great-grandchildren Madison, Shyann and Ariel; brothers Woodrow Wilson and wife Linda of Charleston and Robert Wilson and wife Claudia of Hugheston.